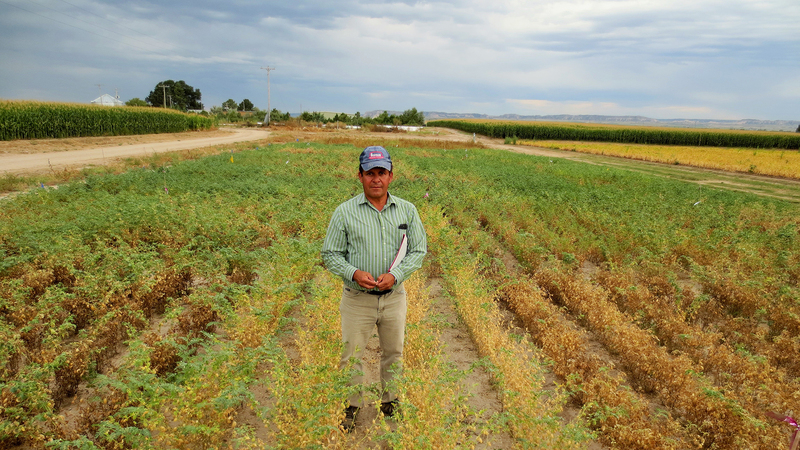 Carlos Urrea, University of Nebraska dry bean breeder, in a field of New Hope chickpeas. New Chickpea Cultivar—New Hope—Offers Just That. After more than 10 years of research, a new cultivar offers enhanced disease resistance for Panhandle growers. SCN Now Confirmed in 58 Counties; How About Your Field? Last year SCN cost Nebraska farmers an estimated $40 million in lost yields. Can you afford not to take the free soil test? Announcing the 7th Annual SCN 'Tode Awards. Winners or losers, these counties now have a better idea of the SCN threat they face. Status of North Platte River Basin and Reservoirs: Precipitation's been above normal and most reservoirs already above 70% capacity. Be Alert to Risk of Alfalfa Winter Injury. Intermittent growth during warm spells may use vital nutrients needed for later growth. Dormant Spraying Alfalfa Weeds. This may be one of the best times to manage winter annuals in your alfalfa. On this week's program view segments on property tax reform, precision ag tools, an IANR update following IANR Harlan Vice Chancellor Mike Boehm's visits around the state, the hog markets, and the forecast for next week.